Can you tell us your current position, company and describe what you do? I’m the Sales Manager (Group Sales Manager) at 360 CHICAGO, the artist formerly known as John Hancock Observatory (the entire 94th floor of the John Hancock Center). May 2018 is 5 years with the company. I drive ticket sales, group ticket sales and look for leads to book events here as we double as an event space for partial and full buy out events before, during and after normal operating hours. I am the concierge liaison for our attraction and all hotels, hostels and non-hotel concierge desks in the city are my accounts. I’m active in a number of business to business networking organizations and chambers of commerce (Magnificent Mile Association, Chicago Hotel Concierge Association, River North Business Association, Choose Chicago, Chicago Loop Alliance, Chicagoland Chamber of Commerce, Streeterville Chamber of Commerce). I have a 10 state region and travel monthly to meet with tour operators, destination management companies and motor coach companies sending groups to Chicago. I also attend national tradeshows to meet with these same targeted operators. All aspects as we are an icon in the city and a tourist attraction. We are connected to all aspects of the city as a result. At 15 years old I was a bag boy in a grocery store. At 16 years old I worked in banquet set up at the Embassy Suites Hotel in Green Bay, WI and that was what started the path I remain on today. I am extremely active in the networking/hospitality/events/concierge community. I volunteer with the Magnificent Mile Association (Membership Committee), River North Business Association (Marketing and Mentoring Committees), Choose Chicago (2017, 2018 Ambassador) and Gateway Green (Green Tie Ball annual gala). 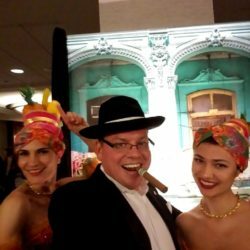 I work for 3 companies on the side as a banquet bartender (Atomic Hospitality, J&L Catering, Shiftgig). I love Chicago and promoting it. I have a lust for life because of the city and that’s why I moved here from Wisconsin in the first place. I knew at 16 years old in my first hotel I wanted some type of career in hospitality. Everyday felt new, different and exciting. In regards to where I am now – me. I didn’t have any true mentors or guides along the way. Everything has been trial and error and learning the hard way. I really like that in hindsight. My guy Jason who I’ve known since 6th grade. I was the best man at his wedding. He’s an entrepreneur out in Washington state at present. Scarface. I’ve seen it more than 50 times and can recite almost the entire movie line for line as it plays. 3 actually – Settle down and have kids. Retire with this company after at least 2-4 more promotions. Travel. I bartend high end private events 95% of my Saturdays. My favorite Saturdays are when tips are good. I’ve have many different ones over the years, but my whole life I’ve been known by my last name – Rondeau. I’m involved with the entire spectrum of events and involvement to varying degrees between my 4 jobs. I’m going to be 40 in October. My baby face has most people think I’m younger all the time. Red Head Piano Bar (RIP Art). For restaurants there are almost too many to name based on category of food, but some are – Joe’s Stone Crab and Prime Steak, PRM Steak, Prosecco, Coco Pazzo, Dimo’s Pizza, NIU Sushi, Beatnik, Bottled Blonde, I could literally ramble forever with this one . . .
It’s a great connecting point for so many personalities that make our scene special. Jim Grillo is a bad man. Not bad meaning bad, but bad meaning good . . . .